The present book on Peri Azwar is my third book relating to Nalayira Divya Prabhandham, the other two being Sri Nammazhwar and Thiruvoimozhi, and Ramanuja Nootrandhadhi which forms the very last part of 4000 Prabhandham. I am happy that these books have well received and continue to be in demand. It is my intention and wish to write on the remaining parts viz. Peria Thirumozhi, balance part of Mudalayiram and lyarpa. Some of my readers have suggested that I bring out the full series of books as soon as possible. God-willing, I Shall. The present book forms the first part of Mudalayiram. Mudalayiram, as the name suggest, consists of the first thousand songs of 4000 Divya Prabhandham. Apart from Periazwar Thirumozhi, there are works of six other Azwars in Mudalayiram, viz those of Sri Andal, Kulasekhara Azwar, Thondaradipodi Azwar, Thirumazhisai Azwar, Tiruppan Azwar and Madura Kavi Azwar. Since original texts are easily available in Tamil / Kannada / Telugu / Hindi languages, I see no point in giving the original text. 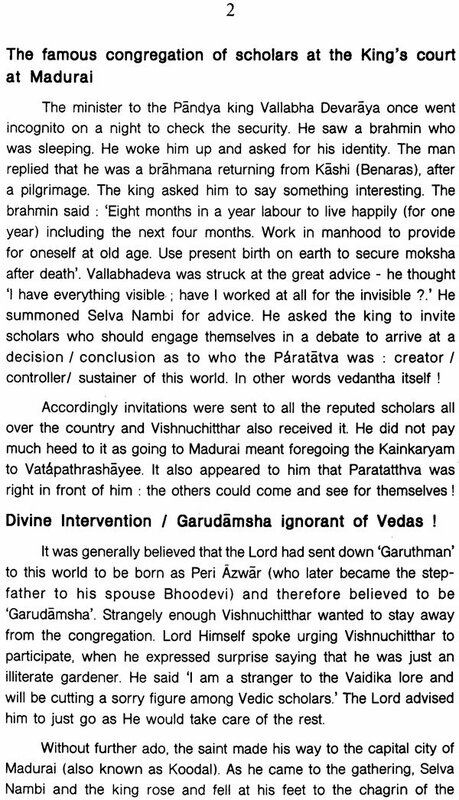 I may be doing it where the original text is too long as in the case of Ramanuja Nootrandhadhi. I shall connect the meanings and explanations with the same numbering as in the original text besides the titles. The azwar of the present book viz Peri azwar has a unique place amongst the azwars and has the distinction of having wished the God Almighty Himself long life. 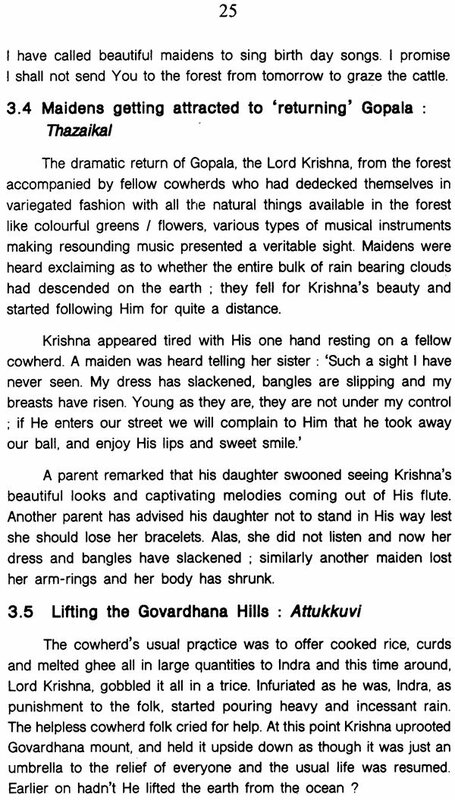 His intense love for Krishna which he has expressed assuming the garb of Yashoda is so rich in bhakthi and lyricism, one needs to read the texts in the in the language one prefers, with meanings / explanations / commentary to be able to appreciate it in full measure. An effort has been made to present the core- aesthetic imports of 44 decades individually. 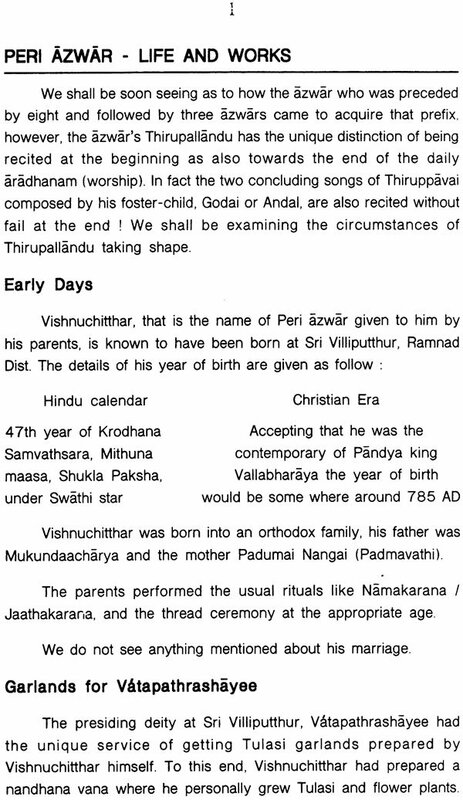 A synopsis / summary of the Peri azwar Thirumozhi is also given to prepare the reader for the dacad-wise presentation. It is hoped that this kind of treatment of the subject Prabhandham will be found useful by the readers.